Below you’ll find our thought papers and technical articles on a variety of vacuum forming and thermoforming topics. They’re free to download. If you have a thermoforming topic you’d like us to cover in the future, contact us and let us know. 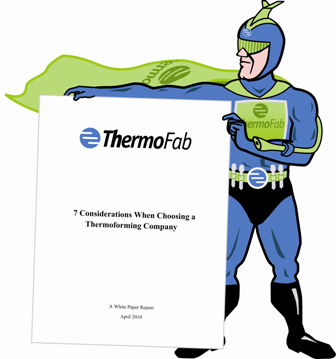 Check out "7 Considerations When Choosing a Thermoforming Company." Download now. Manufacturing At Warp Speed can change the way you think of producing your product. Download now. High-quality materials allow this Heart Laser to be 60% smaller and 1,400 lbs lighter. Download now this technical article now. 3 Reasons Why Some of the Best Ideas Never Make it to Market Download now.